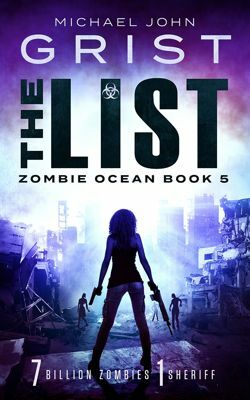 The List is Book 5 in the Zombie Ocean series, and a zombie apocalypse story with a twist: there are 30,000 non-immune survivors who want our heroes dead. 7 billion zombies. 1 sheriff. At five years old Anna survived the first zombie apocalypse, but lost her father. At fifteen she survived the second, but lost even more. She can’t allow a third. She has a list of all the bunkers. She has the skills to take them down. But the bunkers won’t go down without a fight that will change the world. Revenge thriller meets the zombie apocalypse, packed with gore, twists and blood-splattered horror. What cost will they pay? What is the third apocalypse, and who will survive? If you like zombie survival adventures like ‘The Girl With All The Gifts’, ‘The Walking Dead’ and ‘World War Z’, you will love this book. How do I find the final book on ibooks? Sorry Jocelyn, Book 5 is not out on ibooks yet, but it will be in March 2017. Sorry to keep you waiting, and thank you for your interest!